We don’t know about you but we are huge fans of backgammon. It’s one of the coolest board games that you get to play. It may not be as complicated as Chess, but it’s just as fun. Thankfully, there are a few apps to choose from to play this cool board game on your iPhone or iPad. Because the App Store is full of games like this, we’ve looked for a backgammon app with attractive interface and strong artificial intelligence. This isn’t as common as you might think, as some backgammon offerings in the App Store have garish colors or horrid cartoonish boards and pieces. Also If you can beat the app all the time, it’s not much fun. As we searched, we bumped into the one we we’re looking for, perhaps one of the finest ones out there, a backgammon game with stunning and realistic design, easy controls, intuitive user interface and awesome soundtrack and sound effects. 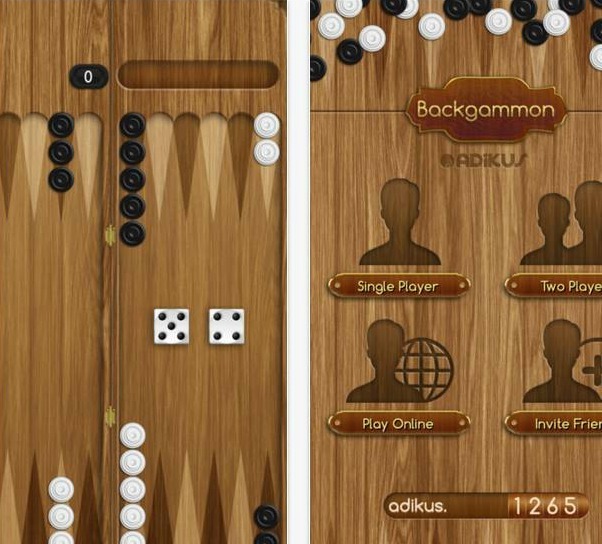 Let’s not stall, the name of the game is Backgammon+, created by Adikus. It can be played on iPhone4, iPhone5, iPhone6, iPhone6+ and iPad Retina designed with iOS 8.0 or later. Backgammon+ provides with three different modes for you to play: a single player mode which allows you to play on your own, against a strong Al with a 3 different difficulty ranges, a multiplayer mode that allows you to play against a friend of yours on the same device, and an online mode that allows you to play online against people from all around the world. Also, it features an easy checkers move (one tap per movement) and a doubling cube (including the Crawford rule), a fast matchmaking and FIBS rating system. Regardless of the player, all dice are rolled completely randomly so you get a fair dice roll. If you want to try it, you can get it for free from the App Store along with the in-app purchase for disabling the ads. Just click the link below!